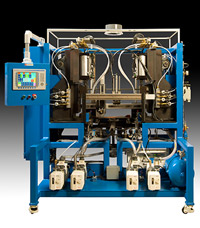 This machine was designed for continuous in-line helium leak testing of hermetic connector housings. The dual sided design allows one system to be under test while the material handling robot picks and places 8 parts for the other side. Dual mass spectrometers, vacuum assist pumps and custom valve blocks are programmed to complete the leak testing. A custom 8 part gripper with some physical part compliance allows parts to be picked from new to older worn pallets. Full pallets are transferred from a driven roller conveyor into leak test machine and then raised into a final unload and reload location. An AB SLC-500 PLC and Panelview HMI is used for the machine control systems and function display. Custom screens with graphical flow charts and performance data include individual chamber test results. All components are housed in a heavy duty tubular steel frame and large Nema-12 enclosure.